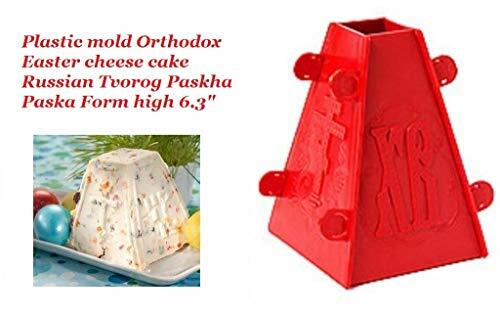 - Russian made traditional paska паска form mold made from plastic to make Russian sort of cold cheese cake no baking involved for Orthodox Easter Holidays about 6. 3" tall. For the preparation of cold cheese Easter. The form for easter cheesecake is large, the volume of the form per 1 kg of cottage cheese, the mass of the finished product is 700-800 grams.
. The height of the form: 6. 3 " 16 cm the size of the bottom of the form: 4. 5" x 4. 5" 11. 5 cm x 11. 5 cm the size of the top of the form: 1. 6" x 1. 6" 4 cm x 4 cm. It is easy to assemble as you can see from my photo. Note: not to be baked in the oven. On sides you can see cross designs and Russian letters XB for Christ is resurrected. Russia - There are as many receipes for Sirnaja Pashka as there are chefs. 6 inch width 5 1/4 inch tall -This contemporary plastic mold is from Russia. There is a receipe in description - Also it comes with the printed receipe. Refrigerate at least 24 hours. Ingredients: 3 lbs cottage cheese or farmer's cheese 2 lbs cream cheese 1 ½ cups of sugar 6 egg yokes 1 tablespoon vanilla 1 teaspoon salt 1 cup whipping cream Mixed candied fruits optional Need for Preparation: Cheesecloth Pashka mold 24 hours before preparation: Line Pashka mold with moistened cheese cloth. Spoon in cottage cheese. Place a small bowel under opening in the mold and allow draining. Spoon cheese mixture into prepared mold:foil ends of cheesecloth over top of cheese. Place mold on rack in a pan large enough to catch excess moisture. Place 1 or 2 heavy can on top of the folded cheese cloth. Let the mixture drain for 24 hours and refrigerate. Red Russian Pascha Paskha Easter Xb Plastic Cheese Mold 6 inch Width - Russian plastic cheese mold With Three Bar Cross and XB letters nearing Jesus Christ. To prepare: in a large bowl, with mixer at medium speed, beat sugar, butter and cream cheese until light and fluffy. Add cottage cheese, vanilla and beaten until well blended, eggs, occasionally scraping bowl with rubber spatula. Plastic mold Orthodox Easter cheese cake Russian Tvorog Paskha Paska Form high 6.3"
Regency Wraps RW450N - The ultra fine grade is ideal for straining, steaming, basting, canning and hundreds of uses in the kitchen and around the home. Regency natural Cheesecloth is made of 100% natural cotton. Bleach free. Russian plastic cheese mold With Three Bar Cross and XB letters nearing Jesus Christ. Ok for use in oven, but keep away from flame. 6 inch width 5 1/4 inch tall -This contemporary plastic mold is from Russia. There is a receipe in description - Also it comes with the printed receipe. There are as many receipes for Sirnaja Pashka as there are chefs. High quality food-grade cheesecloth made of 100% natural unbleached cotton, basting, which makes it safe to use for straining, steaming, and any food application. Regency Natural Ultra Fine Cheesecloth for Straining, Basting, and Making Kombucha, Cheese and Nut Milk, 9 sq. ft - Multiple kitchen uses from basting poultry, straining Soup stocks and custards, pressing tofu, cheese making, decanting wine, making nut milk and kombucha. Cleaning is easier with regency 100% cotton lint Free cheesecloth, when cleaning mirrors, polishing Silver, dusting, car detailing and refinishing furniture. Crafting and decorating with regency cheesecloth is fun for making projects such as ghosts and cobwebs for Halloween, curtains for playhouses, and table center pieces. Biodegradable and eco-friendly.